2012/03/12 - Hublot "$5 Million"
A world first, a unique piece, an exceptional and incredibly rare feat. And a completely different approach was used for its creation. Unlike an Haute Joaillerie piece, where the design and technical construction are created to "emphasise and serve" stones which have already been selected, the opposite approach was adopted. The diamond cutters started with a design and then found the diamonds whxich best matched the complex construction of the case, dial and bracelet. Cutters and setters then employed all of their expertise to resize them to ensure a perfect fit. First challenge: to develop the design of the Big Bang, whilst retaining its graphic codes to ensure it cohesively integrates more than 3 carats of diamonds. Once the technical design was finalised, then the diamonds had to be found and combined. It took one year for the largest stones which came from all four corners of the world, and the same for the 1276 others. Every stone was individually selected to ensure that all were of a consistent quality and colour. They then had to be resized, one by one, to make them a perfect fit for the watch. A renowned "master cutter" from New York with over 40 years' experience was responsible for single-handedly cutting the largest GIA-certified stones to ensure they all had the same cut "signature". It was a lengthy process to complete: 14 months of work for all the different disciplines combined, including 7 months' work for 12 cutters, and the same for the 5 setters, with all the major specialists working on the piece full-time. A total of 1282 diamonds, more than 100 carats of baguette diamonds, a dazzling expression of the work of the best craftsmen in their field. This watch can be considered as a veritable collection of diamonds. A collection of tableaux. Each was individually chosen in relation to the others to create a harmonious whole. This is the most precious watch ever created by Hublot and its long-standing partner, Atelier Bunter in Geneva. 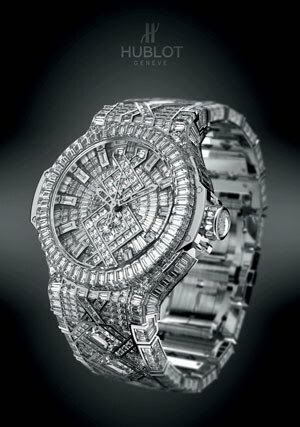 The diamonds selected by Hublot are all of the highest quality, graded A VVS in clarity and Top Wesselton in colour.